Selling on eBay can be a fun hobby, but for one couple it meant paying off a whopping $77,000 in student loans in just three years. Kate and her husband Josh have conquered a mountain of debt by using Dave Ramsey’s principles, eBay, and discipline. I had the privilege of interviewing fellow eBay seller, Kate, who was kind enough to share her story. Kate's loans were incurred in 2008, and her husband Josh's loans were taken out in 2005. They started paying off their debt in August of 2014. If you are facing a mountain of debt, this information will certainly inspire you to tackle it, as well as show you that eBay can move mountains. Where did you attend college, what degrees did you earn, and how long did your education take? Josh went to Christendom College in Front Royal, VA and I attended Catholic University in Washington, D. C. Josh left after his first year due to financial difficulties and I left after my first year after realizing I alone would have been $100,000 in debt just to obtain my Bachelor’s degree if I continued there. We both returned home and continued our education at Onondaga Community College (OCC) in Syracuse, NY. Josh was studying criminal justice while teaching Latin full time at a local Catholic high school. He went on to change his college path when he decided he wanted to continue a career in education and went on to finish his Bachelor's degree at Syracuse University while working full time as a teacher and part time at Target. I finished my associates degree at OCC and went to Syracuse for a semester. I ended up returning to OCC after being accepted into the Physical Therapist Assistant program during the fall of 2011. We both graduated in the Spring of 2013 and got married that same summer, blissfully unaware of the amount of debt we had collectively incurred. What were the original amounts of the student loans? $77,000 spilt up between several smaller loans for both of our educations. How did it feel owing that much money? That first year of marriage we were terrible with money. We had no budget and still had not looked into our student debt as most of them were still in deferment. We were both working full time, Josh teaching and I as a PTA at a local outpatient clinic. When we found out our family was growing from 2 to 3 Josh started looking for jobs that would allow him to support our family. We are both from the East coast so naturally he initially concentrated his search in that region of the US but when a great opportunity presented itself in Minneapolis, MN we decided to go west for that job. I was seven and a half months pregnant at the time and it was quite difficult to uproot, leave the job I loved, and head out to a place where we knew no one. 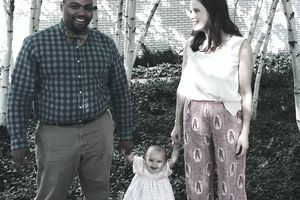 I had decided that I wanted to be a stay at home mom and since I was so close to delivering our daughter I did not look for work when we arrived in Minnesota. After the first week, I had unpacked the entire apartment and was bored as I was not used to having so much free time. I received a few paper bills for our student loans and sat down to figure out how much we actually owed. After a day of phone calls, waiting on hold and computer research I had compiled a list of our debts. We had around six thousand dollars on a credit card, seven thousand for a car loan, and a whopping seventy- seven thousand dollars in collective student loans! My husband did not know what was coming when he came home to a stressed out and scared wife that night. I sat him down at the kitchen table and showed him notebook I had filled that day breaking down the debts, amounts, loan providers, rates of interest and total amount of our debt. This discovery left us with heavy hearts. One of the primary drives that motivated us both throughout our college careers was our misguided trust that higher education would lead to financial stability for ourselves and our children. I knew we had to change our money habits and increase our income in order to conquer this mountain. How did you get started selling on eBay? What made you decide to use your eBay money to pay off debt? I had read a book by the financial expert, Dave Ramsey a few years earlier and decided to look into his program. His program outlines 7 baby steps which are geared towards eliminating debt and building wealth that provides a strong financial foundation and peace of mind. Initially we would have had to pay thousands a month to just be able to keep up with minimum payments. I applied for income based repayment that allowed us to stay afloat and aggressively pay off the smallest loan quickly, another principal of his program. We were able to pay off the first loan of $2,000 in less than 2 months and by then we had caught the bug and wanted to do more. Ramsey jokes about selling so much stuff while paying off debt that the kids think they are next and I took that literally. I started selling my clothing, shoes, unopened wedding gifts, baby diapers, kitchen items — you name it, I sold it. I had always loved thrift shopping but never thought of flipping the items I would find there until I caught the selling bug. I discovered that the Twin Cities has an amazing amount of thrift stores with great prices, coupons, and stellar sale days so I started shopping to sell. Did you use 100 percent of your eBay earnings to pay off the loans? As business improved it was tempting at first to have some fun with this new-found cash flow but we stayed committed to our goal and only used this money to fuel the business and aggressively attack our debt. I’d like to say that I was able to pay off all of that debt with eBay alone but it has been a combination of living frugally to be able to use some of my husband’s full time job paycheck, a few small side tutoring and painting jobs and the reselling business. eBay has played a huge part in our journey to debt freedom. Last year my husband became more involved and helps with everything from sourcing, photography, research, and shipping. He gets dirty looks sometimes while perusing the women’s clothing sections but we just laugh all the way to the bank. We are hoping to finish paying off our loans by the end of 2017. We have about $7,700 out of the original $90,000 that we started with in 2013 to go and then we will be completely debt free! What is Your Advice for others who wish to pay off loans with eBay funds? Many people have approached me with questions about paying off debt with eBay. My advice is to start small selling what you already have and then build your inventory off of the funds and successes of those sales. I still consider myself an eBay novice and continue to learn as I go. I follow sellers that make 6 figures a year selling and try to implement their best practices. I am hoping to continue to grow this business as it is the perfect fit for our growing family. We are expecting our second daughter in September and we are excited to think that we will be debt free well before she has her first birthday! eBay provides limitless opportunities and we look forward to be able start using the profits to save for our first home once the debt is completely cleared. It takes hard work but having my own eBay business and staying home to raise our children is a dream come true. If this true story has inspired you and motivated you to get started selling on eBay, don't wait! Millions of buyers are already assembled on eBay waiting to buy. And you won't believe what you already have in your home or accessible to you that you can sell for a nice profit. The average home has $7,000 of unused items that can be sold online. $7,000 can go a long way when tackling debt, paying for a family vacation, or paying medical expenses. Follow these 10 Easy Steps to Getting Started on eBay an you can create a nice cash flow selling things you don't want, use, or need. 25 million people make money selling on eBay every day, so if they can do it, you can, too!